One dark, windy night, as I walked aimlessly through the internet, I came across a neglected doorway mostly obscured by time and disuse. It stood black and decaying in the midst of impeachforpeace.org. The door seemed like a black hole, sucking everything into it. Not even light could touch this place; it had been swallowed up long ago. A single drop of contempt trickled down the front of the door. A wolf cried out. It was the fora incognita. I had heard the tales of this forum when I was younger, but had always thought they were just scary stories told to children to keep them from wandering off on the internet and getting lost. But here it was, the mythical place long said to be haunted by the World Can't Wait stalking horse Mikael Rudolph - disquietingly known as "the Mime." I stood there before the door and said, "I’m going inside." I grasped the unpolished brass doorknob and turned, it's forsaken innards grinding into action. I swung the door open, and there I stood - at the top of a stairway leading down into the Stygian darkness. Luckily I had my moonbeam plug-in for my browser, and I switched it on. The small pool of light illuminated the gray, crumbling steps enough for me to make my way down to the base of the stairway. The air was musty and damp, sticking to my lungs like the icy fingers of Hillary Clinton on a wad of cash. I shined the light around the small chamber, revealing piles of old documents covered with dust laying on the dirt floor. Age discolored maps scrawled with directions to public parks hung upon the moist cinder-block wall. Cobwebs hanging from the exposed plumbing above my head wafted on the freshly disturbed air, and I noticed a light dangling from the ceiling. I yanked upon the pull-chain and the bare bulb scorched to life. It was then that I could fully observe the disarray of this desolate catacomb. Piles of petitions were heaped upon a shelf, and next to them sat a jar of acerbity. Spam and penile enhancement ads lay in piles at various locations, and they looked as if they had been there for millennia. I stood alone in this clammy emptiness and marveled at the magnificent nescience that surrounded me. A thunderbolt cracked outside, and my chill deepened. A cold sweat broke out across my forehead. It was then that an ethereal figure began to appear from the shadows of the corner. Thin, spectral limbs began to pantomime the "rope pull" as the figure came fully into view. My pounding heart felt as though it would jump from my chest, and my eyes throbbed with the beat of my racing pulse. I tried to formulate a retreat strategy like Obama on inauguration day, but the Mime's vacant stare kept me transfixed. Unable to move, the Mime moved ever closer. "Immmmpeeeeeeachhh...." hissed the vile creature, it's hot breath turning my cold sweat to vapor, causing it to evanesce from my head. Outside, the wind howled, and I wondered if I would ever get out of this terrifying place. Suddenly I was seized by the Mime! He shook me violently as he shrieked "I am a borderline genius!" and "You're a digitally lobotomized, FAUXNews addicted, Bush-worshiping knuckle-dragger!!" It was then that I knew it was all over for me, and any chance of escape or rational conversation was washed from my mind. Then, spiraling into the swirling, giddy darkness that awaited me, I remembered Laika. I knew for sure that he would find me, knew that my comrades at The People's Cube would be glad when he had done so, and finally closed my eyes with a gentle and final gasp. So terrible... LAIKA! Save him! Oh, Lenin, what has happened, AK! Someone help him! We need the Holy Goremon handgrenade of the Apocalypse, or send in the Chinese Olympic DeathRifle squad. Mikhail, you were warned to stay away from that place, with its gloom and self-pity and chambers of sensory deprivation. Now you've awakened the beast. We have to stop him from unleashing his many plagues upon civilization. Don't you see? He's going to try and regenerate himself by clicking on one link after another until he finds something anti-Bush, no matter how remotely anti-Bush it is. He's going to copy it, and paste it. Then he's going to copy and paste some more, from one Progressive website after another, until he's sucked the Potemkinsphere dry. There'll be no stopping him, for this beast we call The Mime is not mortal. You can't shoot him. You can't hack him up with a scimitar. You can't torch him. Only one thing could possibly stop him, turn him into a mortal, and allow us to destroy him. And that's to feed him trolls who are digitally lobotomized, knuckle-dragging, Faux News addicted, Bush-worshiping 19 percenters. He loves them. He loves to toy with them and make fools of them with his arsenal of links to other sites in the Potemkinsphere. He loves turning the tables on them and tripping them up with his own borderline genius wit. He loves to poke them with a stick and make them mad, because he knows they're sad, depressed souls with no lives, who are full of self-loathing and hate everyone and everything. You might try throwing a cat at him. Pinkie, Mikhail, I think that it is time to reveal that the Mime is the next generation of True Progressive. We have taken their property, we have taken their loved ones' lives, we have taken their free speech. Now behold the Mime: we have taken his very soul. A dank squamous being, lurking ethereally in the nether regions of the world, where facts do not exist and rumors swirl. Where personality has dissolved into impotent rage. The Mime. Our greatest success. Once a human. Now...a...mere...Mime. Spiked hats off, Ladies and Gentlemen. The un-person. I am here for you AK! Begone evil, but totally harmless and ineffectual MIME! Begone wimpy spineless un-scary limp WCW demon! Upon thy Holy Book of Gormon I Command Thee to Freeze without Global Warming! I fear this sort of demon is not so easily exorcised Comrade Space Dog. There is also a greater danger in that unless you have something to replace the space inhabited by the Mime demon, then seven more moonbat demons will come in and take it's place. I could get him out. Using only a rusty shovel. As cancer is not one disease but a group of them, so is mimicry. 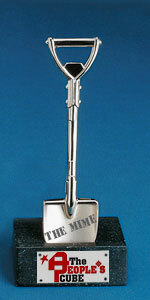 Has anyone seen the silver shovel we keep for these occasions? It only works on full moons, so we can't rescue AK until the 20th. At least we'll have time to plan. Also, beware Pupovich's warning! The seven moonbat demons that return are actually worse than the one that Laika cast out. They reproduce by cellular division when they're simple mimes, and then they take over host bodies. Ever see Alien? Ah! Here it is. Hang on for another few days, AK, we'll be there with the silver shovel which magically repels the demonic forces of moonbatic mimes. Excellent dig, Comrade Blogunov! You are hereby awarded with the Hero Scout Medal and Award, Second Degree. It's buried in...a block. Wasn't there a post somewhere on the Cube of a man with a cubical head? Why not have the shovel buried in it? Thank you, Dear Leader. I humbly accept this award on behalf of the PeopleTM in recognition of their struggle for the Greater GoodTM. So filled am I with selfless love for the collective that I invite all party members to come to my apartment and share the extra potato that came with the medal. An Inner Party party will follow - Punchenko, remember the Sharpies. That reminds me of the Sword in the Stone. What will happen to whoever can pull the shovel out of the block (or cube)? or maybe like "Invasion of the Body Snatchers"??? I think that they're pod people. 2016 Ghost of Krushchev Declares "We Have Barried You"